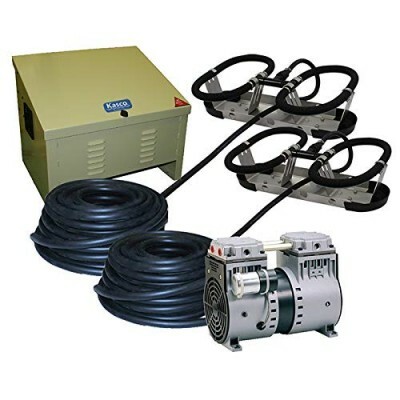 The Kasco Marine Robust-Aire Aquatic Aeration System uses superior diffuser materials and design. This thoughtfully designed, superbly efficient diffuser allows air to escape at a very low pressure, producing much smaller bubbles with less friction loss. The bubbles are approximately 3mm diameter. The U-shaped design of the four diffusers enhances the upward flow of water. Robust-Aire has been tested alongside 6 other leading designs from 4 different manufacturers. Between 10% - 44% more water flow was induced with the same amount of air injected into the water column. 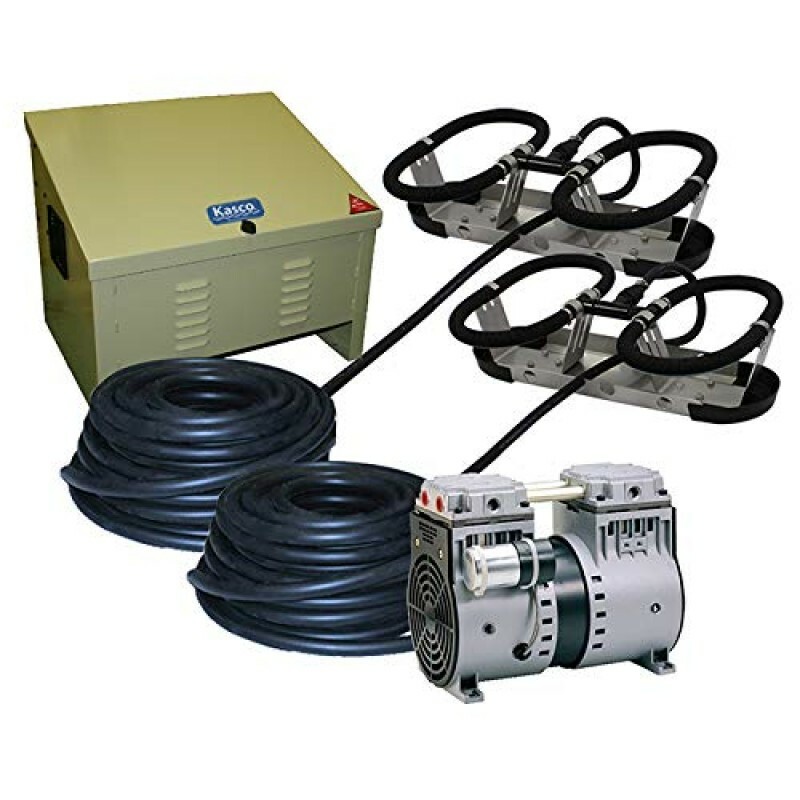 The Robust-Aire system simply creates more pond aerating water flow with the same amount of air and energy, making it the most efficient bottom aeration system on the market. The effect of the Earths gravity on the "lift" or head pressure is fairly simple; for every vertical foot of distance the pump moves the water you are adding one foot of head pressure so the ratio is a 1:1 ratio. The effects of the friction, caused by water as it travels through your hose or pipes, on the total head pressure is a little more difficult to calculate especially as there are slight variations in pipe friction in different hose materials and the smoothness of the inner bore. Basically. for every ten feet of pipe through which the water has to travel travel horizontally will contribute 1 foot of head height; the ratio of the pipe friction loss is a 10:1 ratio. Plumbing fixtures and bends and corners in your hose also increase the total head you must calculate to ensure the proper final volume from your pump. Every corner with a 90 degree elbow in your plumbing will add 1 foot of head pressure with a 1:1 ratio. 45 degree elbows, tees and even insert couplers can all have an impact on the final flow. If you install a pump 40 feet away from the top of your waterfall which is 6 feet above the pump and the tubing is a single run of 40 feet horizontally then you add 4 feet of head for the tubing length (the 10:1 ratio) to the 6 foot differnetial between the pump location and the final height of the waterfall so your final total dynamic head calculation would be 10 feet. This means your final volume of water flow in this water feature or application would be the volume of flow on the performance curve that equaled the gallons per hour at 16 feet. This volume will certainly be much less than the initial volume the pump can move at an open flow or a zero head. If in the above example your 40 feet of horizontal tubing run also required 3 elbows of 90 degrees then an additional 3 feet of theoretical head would be added and your final flow result would be at 19 feet on the performance curve of the pump. In this example you would want to choose a pump that has the desired GPH rating at 9 feet of head pressure. Tubing size is also an important factor in accounting for head pressure loss, in general you should never reduce the diameter of the tubing below what the output size of the pump is, this will drastically increase head pressure, and reduce pump performance. For maximum pump performance, using the largest tubing that is practical is the best choice. A best practice is to use a hose with an inner diameter that is the same as your pumps outlet fitting. PondPumpsCanada.ca is a participant in the Amazon Services LLC Associates Canadian Program, an affiliate advertising program designed to provide a means for sites to earn advertising fees by advertising and linking to the Amazon.ca marketplace. Product description, photographs and reviews and other various content that appears on our website comes from Amazon Services LLC. This content is Provided ‘AS IS’ and is subject to change or removal at any time. PondPumpsCanada.ca - A Proud Canadian Website.